Peter Childs appeared as five different characters in the street. Here he is in 1971, an episode famous for Ken Barlow’s first wife electrocuting herself with a hairdryer. Other episodes may be on YouTube. Fair play, I love watching Peter Childs in action, doesn't matter what it's in, he great. Thanks for reminding us he was in Corrie Zimbo! When you think about it, he could have played the 'Mike Baldwin' character. Though IIRC when he was introduced, it was around the time that Peter was prominent in 'Public Eye'. Baldwin was introduced in 1976. I'm sure Peter would have been excellent in that role as he was for any that he played. 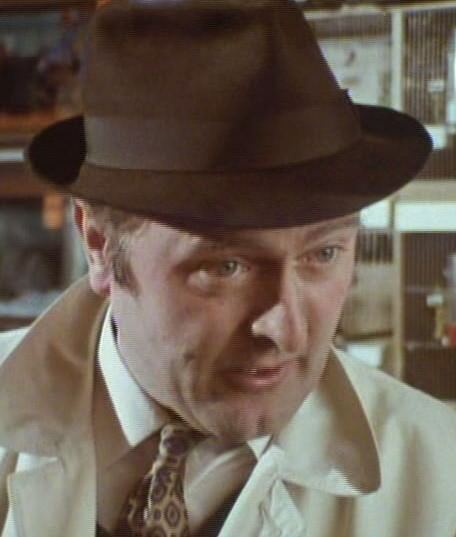 Here he is in 1980 as insurance agent Mr Emery, who was acting for the wife of bigamist, Arnold Swain. This was less than a month after his 2nd appearance in Minder, 'The Old School Tie'. Fascinating. I actually remember watching this episode, although I would have said she died while ironing. It was always on in our house in those days. I probably remember it because there was an unusual element of drama in this episode with Valerie Barlow managing to electrocute herself. I didn't know Peter Childs was in it but virtually every actor got a chance to say 'appen, summat and 'ow do just like they do oop north at some point in their career. Corrie was rubbish wasn't it?